Football is regarded by many as the premier sport of Australia which is even taught in schools. Football is one of the most exciting and lovable games of the Australian population. The Australian footy teams are absolute favourites of indigenous as well as viewers of the world. Football Federation Australia is the national organisation where all the Australian footy teams register themselves. The Football Federation Australia is a member of the Federation Internationalé de Football Association. Football Federation Australia is a member of the Asian Football Confederation and it is the governing body of Australian football teams. The Football Federation Australia has member teams from Queensland, New South Wales, Northern Territory, Australian Capital Territory, South Australia, Victoria and Western Australia. The football code for an Australian team would vary according to the place they live in, the code they were taught at school and by their cultural heritage. The end of summer is characterised throughout Australia as the beginning of the ‘footy’ season. Professionally the football season spans from March to September. Some of the well-known football teams of Australia include—Fremantle, Kangaroos, Western Bulldogs, Richmond Tiger, Adelaide Crow, Port Adelaide, Sydney Swans and Melbourne Demons among many others. Among the Australian footy teams, Fremantle is nicknamed as The Dockers and is one of the 16 premier teams in the Australian Football League. The club is located at the port city of Fremantle and is currently coached by Mark Harvey. Western Bulldogs is also a top-rated team of the Australian Football League and is referred as Footscray Football Club. The club is based at an inner western suburban area in Melbourne and is slowly gaining popularity among footy lovers. Sydney Swans is a well-known Australian footy team of the Australian Football League which is based in Sydney, New South Wales. The club was originally known as South Melbourne Football Club and in 1982 became the Sydney Swans. The team has won many international and national football leagues. The Adelaide Football Club has been nicknamed as the Adelaide Crow and is a significant member of the Australian Football League. The club is located at the West Lakes and is one of the Australian Rules football club. The Melbourne Football Club is commonly known as the Melbourne Demons and is a premier team of the Australian Football League. The club is based in Melbourne and is one of the oldest clubs of Australia as well as the world. The club will complete its 150 years in the year 2008, since it was formed in the year 1858. 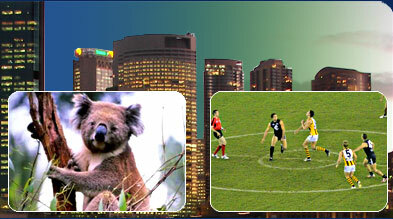 Apart from these, there are many other Australian footy teams which enjoy great popularity with the Australian people. These Australian footy teams have won many international and national football league matches. Nowadays, even Australian footy teams are fast gaining popularity among international soccer lovers and are great crowd pullers. In order to cheer your favourite footy team at the Premier League or any other famous football tournament you need to book your tickets much in advance. You can take the help of ticket booking agencies and watch your favourite Australian footy team live in action at the football grounds.